Find Your Park at the Gettysburg National Military Park. This month we continue our Find Your Park in our backyard series, featuring the Gettysburg National Military Park. 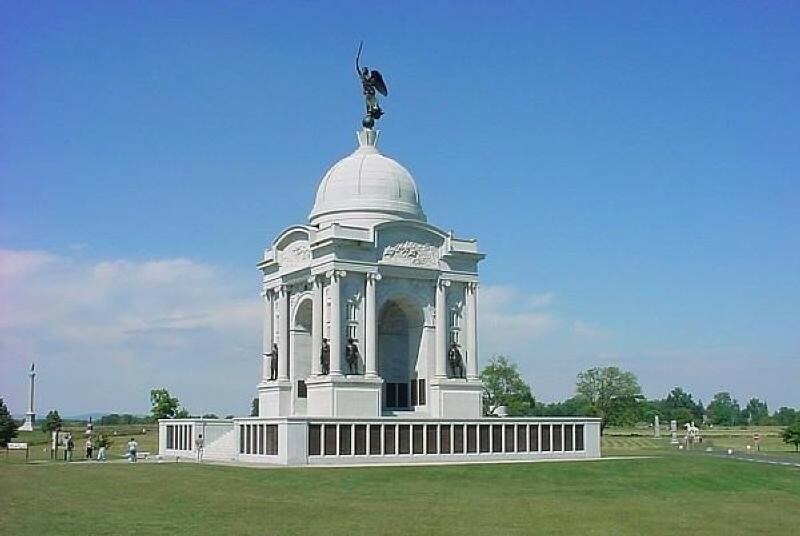 Just an hour’s drive from the Inn, Gettysburg is a great day trip for guests. The Battle of Gettysburg, where the Union victory ended General Robert E. Lee’s second and most ambitious invasion of the North, is considered a turning point in the Civil War. 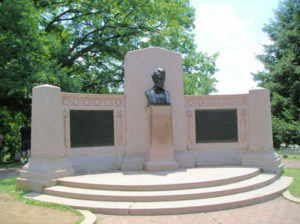 Often referred to as the “High Water Mark of the Confederacy”, Gettysburg was the Civil War’s bloodiest battle and the inspiration for President Abraham Lincoln’s immortal “Gettysburg Address”. In June of 1863 Robert E. Lee was moving north again. Just nine months earlier his first incursion into the North ended with the Confederate retreat from Antietam. Motivated by his recent victories at Fredericksburg and Chancellorsville, Lee moved his army west of the Blue Ridge, through the Shenandoah Valley across the Potomac River, and into the Cumberland Valley. Once again the people of Maryland found themselves between two great armies, with Lee moving into Pennsylvania and the Union forces following cautiously, while still protecting Washington. On June 30, elements of the two armies would meet just west of Gettysburg. The next day, on July 1st the fighting would escalate throughout the day as both Union and Confederate forces arrived on the field. Despite the Union attempt to defend their lines, the Federals were forced to retreat through Gettysburg and rally around Cemetery and Culp’s hills. By the morning of July 2, the main body of both armies had arrived on the field. The Union army, under Maj. Gen. George Meade, formed a defensive line south of town along Cemetery Ridge with his flanks tied to Culp’s Hill on the right and Little Round Top on the left. Gen. Lee launched a series of attacks on both ends of the line, but they were checked by Federal reinforcements. On July 3, Lee decided to focus on the center of the Union line. Preceded by a two-hour artillery bombardment, Lee would send some 12,000 Confederate infantrymen to break through the Federal line on Cemetery Ridge. Despite their heroic effort, the attack was repulsed with heavy losses sustained. Lee realized that he could no longer continue the fight and on July 4 he retreated back to Virginia. The Battle of Gettysburg was over. In the three days of fighting there would be 51,000 casualties. Gettysburg would be forever known as the “High Water Mark of the Confederacy”. Visitors can be a little overwhelmed by Gettysburg, so here are a few things that will fill your day. The Museum and Visitor Center is the best place to start. After you watch the film, “A New Birth of Freedom”, go into the Cyclorama. This three-dimensional diorama brings to life the battle’s climatic event of Pickett’s Charge. After the movie and cyclorana you may think you know everything about Gettysburg, but head into the museum to understand the story of the Battle of Gettysburg and its significance to our nation’s history. Tour the Battlefield. The best way to understand any battlefield is to get out and see the terrain. Using the park brochure you can follow the self-guided auto-tour or guests of the Inn can borrow our ‘Gettysburg Field Guide’. This audio CD and guidebook allows you to explore the battlefield at your own pace. Soldiers’ National Cemetery. There are more than 6,000 veterans buried in the national cemetery, including 3,500 Union soldiers. See the site where President Abraham Lincoln gave his Gettysburg Address. If you have time, be sure to stop by the David Wills House to see where President Lincoln stopped to put the finishing touches on his speech. Ranger Program. Check out the daily schedule of these free ranger guided programs. NPS Rangers bring to the life the story of the Battle of Gettysburg, and the American Civil War, by exploring the Soldiers’ National Cemetery, walking in the footsteps of Pickett’s Charge, or hiking the slopes of Little Round Top. Eisenhower National Historic Site. Visit the home and farm of General and President Dwight D. Eisenhower adjacent to the battlefield. You can purchase shuttle and admission tickets to the Eisenhower home at the Museum and Visitors Center. 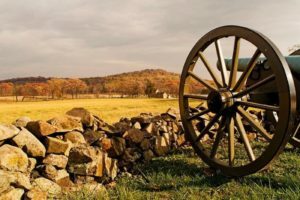 “Gettysburg National Military Park offers visitors the opportunity to immerse themselves in the history and culture of the 1863 Battle of Gettysburg and the Civil War. Each year, more than one million visitors explore the site of this pivotal Civil War battle and the place where President Abraham Lincoln outlined the future of the nation in his Gettysburg Address. Visitors who experience Gettysburg National Military Park leave with an understanding of the scope and magnitude of the sacrifices made by soldiers and civilians alike, which ultimately gave way to a new birth of freedom for our country”. Now get out and Find your Park – Visit Gettysburg.